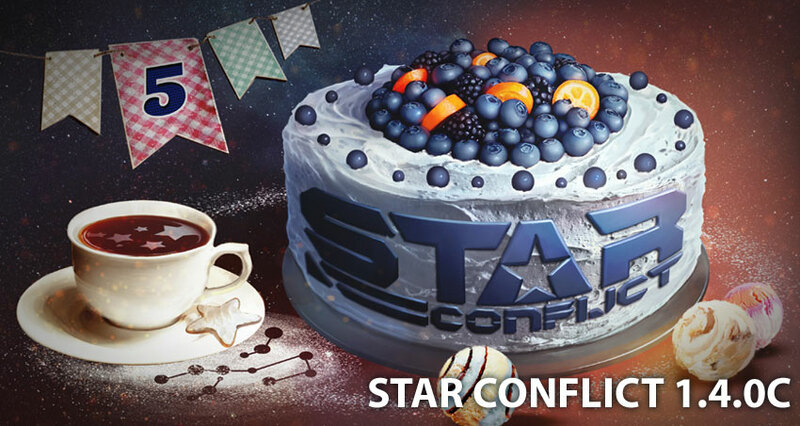 Star Conflict Celebrates Fifth Birthday! StarGem Inc. and Gaijin Entertainment’s epic free-to-play MMO action game, Star Conflict, celebrates its fifth anniversary today, inviting all fans of the genre to join the festivities around the birthday of this vast game universe. The developers have introduced a variety of gifts for pilots who login to play between February 3rd and February 5th, and also shared their plans for the future development of the game. From Friday to Sunday, all players will also earn 50% more experience points in combat and can unlock unique decals and colouring schemes for their spacecraft by participating in various special birthday events. A set of honorary titles depending on the veterancy of the player is also available for pilots who registered to play the game since Closed Beta. Further birthday incentives include a free two days of Premium account and 100 Xenocrystals, which can be used to craft and upgrade the new and exciting vessels introduced in the recent Evolution update. Representing a fusion of human and alien technology, these extraordinary vessels - like the Thar’Ga class - are capable of extensive and flexible customization, which allows players to upgrade and modify their ships to thousands of very unique different variations and configurations based on their own play style and preferences. Since its public launch in mid-2012, Star Conflict has continued to grow and expand, opening new and exciting opportunities for its players through regular content updates. Initially released as a session based PvP online game, the developers soon after introduced cooperative PvE elements into the game which eventually turned into a full-scale deep space of free exploration and discovery. This introduction of an ‘open universe’ not only expanded the game’s content, but also added significant enhancements to gameplay. Players met new adversaries, fought-off waves of relentless aliens and acquired new technologies allowing the construction of the mighty Dreadnought and Destroyers class ships. Those giant vessels can participate in large-scale battles that decide control over entire sectors of space, allowing player-controlled corporations to expand their hegemony over the known universe. Soon, a new update will further expand the features of Star Conflict, and you can read all about the development plans in the developer’s diaries found here. Developed by Star Gem Inc, Star Conflict is an action-packed, massively multiplayer space simulation game that puts players in the role of elite pilots engaging in a widespread interplanetary skirmish. The game includes a wide variety of battleships, from light and fast interceptors to powerful fighters and well-defended frigates. Players can choose to go it alone or team up with friends to form powerful alliances. The combination of strategic and skill based gameplay in Star Conflict allows players to develop their abilities and establish specialized skills. Find out more about Star Conflict here.